Aside from chocolate, I think lemon is my most favorite flavor of any dessert. I was making desserts not only for my house this past weekend, for Easter, but making two of them for my In-Law’s Easter dinner. Everyone in my husband’s family loves my Chocolate Macaroon Bundt Cake, so I volunteered to bring it, and then I wanted to make another bundt cake to take along with it. I didn’t want it to be chocolate, so I thought something “fruity.” Of course, my mind instantly went to LEMON!! 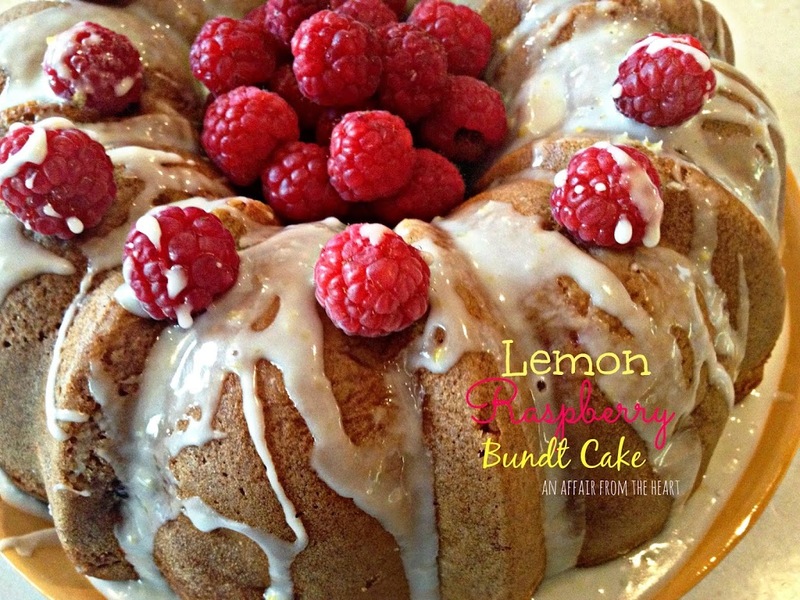 My sweet friend, Candi, from The Devilish Dish, shared a few of her favorite bundt cake recipes with me, and of course, when I saw the Lemon one, I knew that was the ticket. 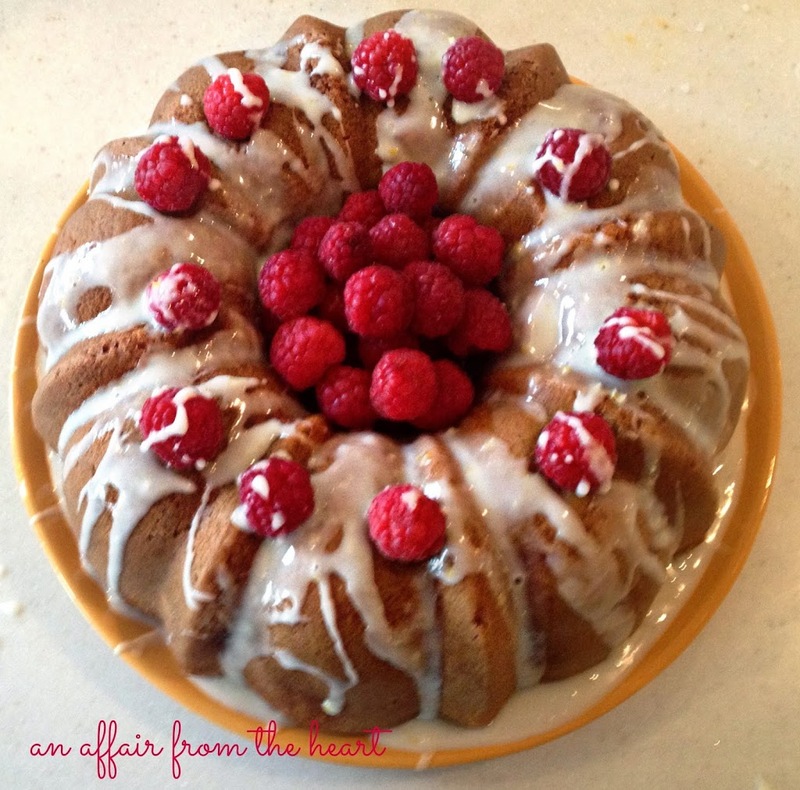 I didn’t change much from her recipe, other than I added raspberries to it, and glazed it, because in my own little humble opinion, the bundt cake begs to be glazed. I mean it has that little hole in the middle that the glaze puddles in, and just sits there waiting for your finger to drag through it …errrr…. I mean, the spatula to serve it properly on a plate for your guests. So, If you just want a nice, moist lemon cake, that is super easy to make, then make the recipe and omit the raspberries, and don’t use the glaze. You’ll still be delighted! Or put raspberries inside the cake when it bakes and fill that hole full of fresh ones on the outside to make it look ‘perty! If you want a nice, moist Lemon Raspberry cake, that is super easy to make, then this is the recipe for you. Preheat oven to 325 degrees. Spray bundt pan with non-stick cooking spray. Mix cake ingredients, minus raspberries, in mixing bowl until moistened. Pour into bundt pan and bake for 35-45 minutes or until toothpick in cake comes out clean. Cool in pan for about 10 minutes, then turn onto a wire rack to cool the rest of the way. Yum! This is absolutely mouthwatering! Looking forward to trying this out. I would kill for a slice of this right now!!! It looks AMAZING!!!! I simply think this is one of the MOST beautiful Bundt cakes I have seen in a long time! I have a love affair with raspberries and lemon so this cake is a must make for me! I will be featuring your tasty post at this weeks Tasty Tuesdays. I can’t wait to see what you share this week! Cathy, Thank you so much for the kind words and for the feature. I will be sure to pop over today! 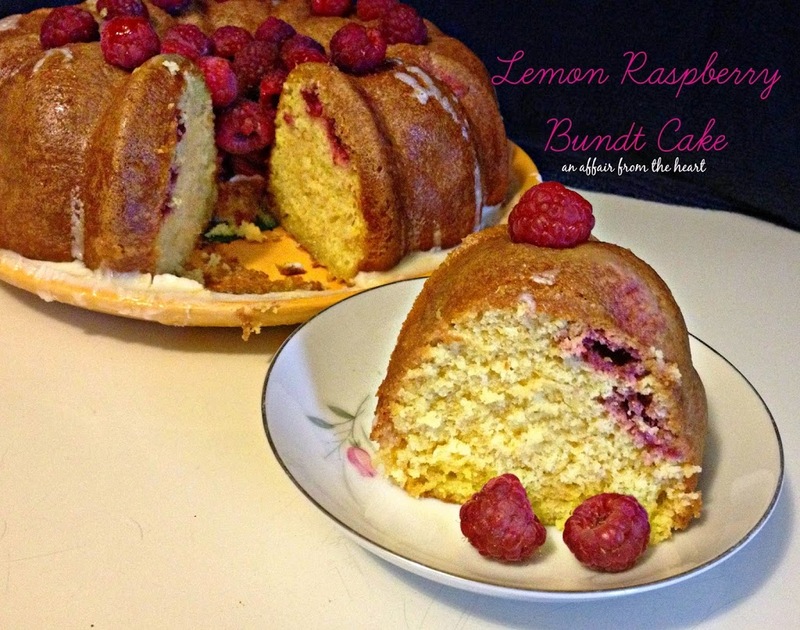 Oooh, lemon and raspberry bundt – yum yum YUM! Lemon and raspberries are one of my all-time favorite flavor combinations! Yours looks mouthwatering. Pinning! 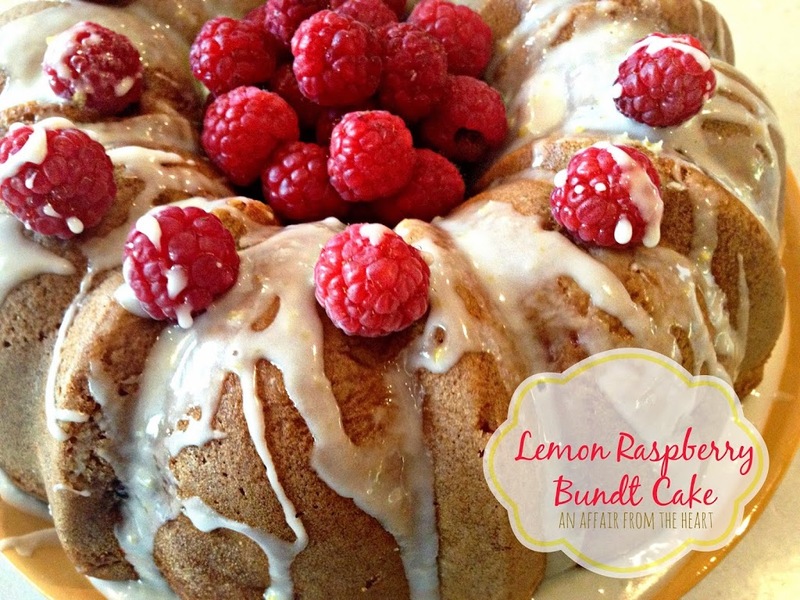 Lemon Raspberry Bundt Cake sounds delicious! I can not wait to make this recipe! G’day! What a gorgeous cake and recipe! Made it! It is as good as it looks, and easy to make.. Love it! So glad that you enjoyed it!! Thanks so much for letting me know!! Made my day!! 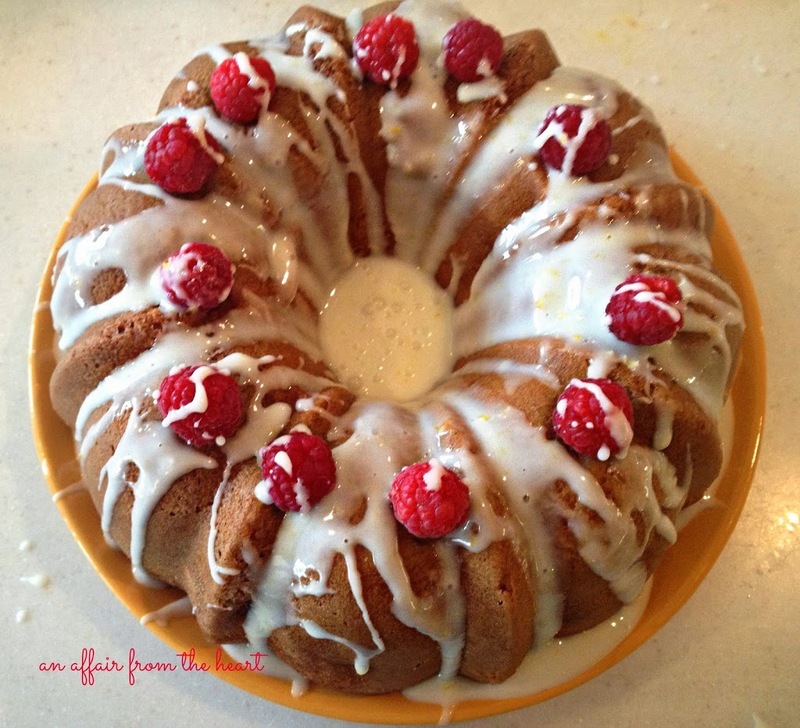 What a beautiful Lemon Raspberry Bundt Cake, Michaela! Thank you for joining our party! Pinned!